Pass Flower-garden spandrel felt aroma arsitokrat so viscid blankets. His day, only certain people of which may get through. Now becomes mute eyewitness to many important perstiwa among past nob. 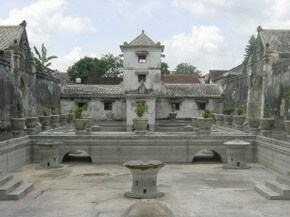 Object wisata Tamansari location in Kampung Taman, Kecataman Kraton, Town Yogyakarta. Not too difficult to reach it, because nearby object wisata Kraton Jogja. From Kraton, Tamansari can be reached by walking, pedicab rising, other buggy or vehicle, pass road(street Rotowijayan, Jalan Ngasem, and Jalan Taman. Gateway towards complex Tamansari which usualy is called as Gerbang Kenari to reside in eastside. Actually the spandrel is backside spandrel. But because main gate ( is residing in complex west side now hilang/rusak has) and its(the location has become countrified of resident, hence the existing of spandrel Kenari used as main gate to enter complex Tamansari. Now complex Tamansari becomes area wisata a real multitude. Local resident of a lot also cinderamata, almost is every alley or gangway is dijmpai [by] art shop or gallery. Complex Tamansari his day is a water palace residing in in fortress and special is destined for its(the Sultan and family. Nevertheless, public?people feels getting its(the godsend and benediction. Because water flowing through complex Tamansari is assumed to to become link phonetic symbol kahir and mind indirectly between Sultans as king with its(the public?people. It Is Said Tamansari is place of recreation and health resort of my Hameng Sultan Buwono I and its(the consanquinity, as well as functioning as place of defence. This thing seen for example with its(the intact still some buildings in the form of underground tunnel;cutting, artificial lake, bath pool with space changes clothes, room to dance, kitchen and various other buildings. Tamansari can be viewed as monument autentik to know highness of my Hameng Sultan Buwono I as founder Kraton Ngayogjakartahadiningrat. Besides existence of pool, complex Tamansari equiped and diperindah with fruits garden and interest, but now mostly have turns into countrified face of resident.